Sheeladevi Public School, Nagpur has advertised in THE LOKMAT newspaper for recruitment of Principal,Teachers jobs vacancies. Interested and eligible job aspirants are requested to apply on or before 21st and 22nd walk-in April 2018.Check out further more details below. 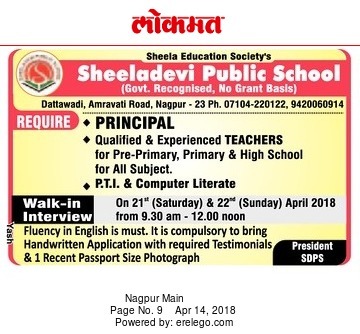 Name of the School: Sheeladevi Public School, Nagpur. About School: Sheeladevi Public School, Nagpur is a co-educational institution in Maharashtra. How to Apply: It is compulsory to bring handwritten application with required testmonials & 1 recent passport size photograph. Interview Date: walk-in on 21st (saturday) & 22nd (Sunday) April 2018 from 9.30 a.m and 12 noon. Reference: Advertisement on LOKMAT newspaper Dated 14th April 2018.